PM: So, let me get this straight. One of you lives in England and the other lives in the USA? Jim: Indeed. I am from Kent, England and Sean is from Detroit, USA. Sean: Yep, we are far away from each other. Jim: But not galaxies far far away, it’s not like I live on the ice planet Hoth. PM: How did this project begin? Sean: Jim and I found each other on the internet and started writing together. Our first band, Shock of the Cold began in 2004 and ended in 2008. We did a few albums and played countless shows in the Michigan area. 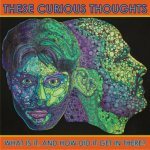 After Shock broke up, Jim and I continued to write and formed our new band, These Curious Thoughts. PM: What were your intentions when you started These Curious Thoughts? Sean: I think the band came out of our friendship and musical partnership. We were going to continue to talk/Skype with each other and write music so it was just natural that we would have a band to formally put our music out. Jim: We literally can’t stop writing music, we have tried but can only ever go a month or so but then we get bored and have to make something new. PM: Does the Atlantic divide make it easier to avoid physical conflict over creative differences? Jim: Hmm, I don’t think we have ever had an argument over the direction of the music. I have complete faith in Sean’s ability to create what he does out of the ramblings I send him. In saying that, he wouldn’t argue with me as when I popped over to Detroit in 2007 I implanted a tiny explosive in his head that can be trigged by the keys on my laptop! Sean: Yes, there is always that reminder that I cannot get too harsh with Jim or he will detonate the bomb and turn my thoughts into scrambled spaghetti! – but seriously, we just enjoy working, composing and interacting with each other. Being separated by the ocean allows us to act creatively when we feel like it. Each person experiences their creative energies at different times and in reaction to different stimuli, so not having to sit down together and crank out tunes in a matter of hours helps us. When Jim is creative he writes lyrics, when I feel creative I do the music or video. It all works out nicely. PM: Your latest EP, ‘What Is It, and How Did It Get In There?’ seems to focus on Batman and John Wayne. What’s the reasoning behind this idea? Jim: I’m a big fan of Batman. I am really into my graphic novels...The Killing Joke is one of my favourites. I think the idea for the song “John Wayne” was inspired by a line from “Kelly’s Heroes” by Blackgrape - y’know, that Jesus was Batman. I basically thought it would make more sense if it was John Wayne, because they have the same surname and they are both double hard bastards! Sean: I think that the notion of Batman and John Wayne sharing a bloodline is quite unique and weird. It is a curious thought and the demo has many curious thoughts on it. I think John Wayne stands out because it is so inherently strange. Good one Jim! PM: Do you always agree on a concept before beginning the song writing process. Is there any room for spontaneity? Jim: Lyrically, it’s basically written off the cuff, all tongue in cheek in not so much a stream but a bloody big lake of consciousness. I don’t think I have ever tried to write in a certain way about a particular subject before. I’d say it’s all pretty much spontaneous. PM: Do you begin with lyrics or music? Jim: I think it has always more or less been lyrics first. In saying that, Sean writes so much music that sometimes he will send me riffs and I will try to put words to the music. It’s much harder that way though. Sean tends to go away to this cool island retreat in Canada twice a year where he writes these cool sounding instrumentals and then emails them to me. Our last song “Shades Of Gray” was written this way. It has some sweet steel drums going on and lyrically it kind of reminds me of “Polly” by Nirvana. It has nothing to do with the saucy books of the same name…honest! Sean: Yeah majority of the songs are lyrics first. Most of the time Jim’s lyrics inspire me so that I sit down and the music just comes out within a few minutes and after a half hour or so we have a polished rough draft that we can work with. I really enjoy some of the songs we have done the other way with music first. Jim will write lyrics and give me a basic melody idea he has and then I run with it. There is the occasional song we write together such as when Jim visited the US in 2007 or over Skype. PM: What is your policy on playing live? Has it happened, and is it a plan for the future? Jim: I will let Sean answer this...All I will say is I am hoping to get some gigs sorted when he comes to the UK in the next few years! Sean: Yes Jim, I will definitely get myself over there for some tea and live shows. Live is an important aspect of this project. I have played in live bands since I was 15 years old, and I love playing out. Shock of the Cold was a fantastically talented group, I really enjoyed the dynamic of the group. TCT is currently playing out, but it is a bit different. The group is a trio, Sean Nasrey on drums, Dan Steffy on bass, and me on guitar and vocals. The songs are stripped down to their raw nature and we have a great sound. Since most of the songs are recorded with multiple instruments this really gives the live shows a whole other element that you can only experience live.